Emeryville announces the receipt of an award of excellence from the American Planning Association (APA) for our newly enacted Pedestrian/Bicycle Plan. 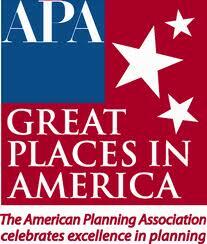 The award issued May 17th is in the APA Northern Section Awards Program for 'Outstanding Planning on a Focused Issue'. 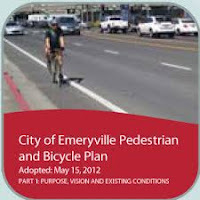 The APA notified Emeryville that the Ped/Bike Plan is also eligible for a California Chapter APA award to be decided this summer. Emeryville's Ped/Bike Plan was forged over two years with help from the Bike/Ped Committee and Alta Planning of Berkeley at a cost of some $200,000. Professional planners have praised the new plan as forward thinking and practical, that will help to alleviate problems associated with excess vehicle traffic and make for a more livable city. The plan earmarks certain identified streets as low volume, slow streets to help bicyclists commute along safe and direct routes. These routes, designated as bicycle boulevards were planned with a mind to commuting between neighboring municipalities in a seamless way, something the APA noted was worthy of commendation. Members of the newly formed City Schools Master Plan Task Force, a group set up under the auspices of a paid School District consultant, received notice of an astounding "ground rule" at their first meeting on April 29th: a gag order forbidding contact with the media, including blogs and other local electronic media. In February the Tattler brought you the story of the School District's decision to pay $170,000 to consultants, MIG and MKThink, to facilitate a Task Force that would determine the fate in a post-Emeryville Center of Community Life (ECCL) world of six public properties that currently provide community services. Only three of those sites, Anna Yates Elementary School , the former Ralph Hawley Middle School, and the San Pablo Avenue dump site that is the future home of the ECCL (aka the former High School) are actually under the control of the School District. The other three sites, the 43rd Street Recreation Center, the Senior Center, and the Emeryville Child Development Center, are operated by the City. The future of only two sites is really in doubt, that of the Anna Yates Elementary site, and the Recreation Center. The Task Force was eventually created by both the City and the School District at a recent City Schools Committee meeting. While the Task Force members and the public will be invited to six Task Force meetings, the consultants will conduct more than twice as many private closed door meetings as well. 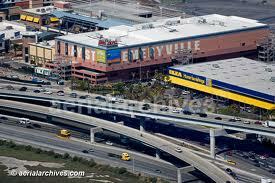 Emeryville residents needn't fret that the consultants will be over-worked. If they conduct the originally-planned 22 meetings, then that works out to just over $7,700 per meeting, generously provided by Emeryville taxpayers. For that price, one might expect that these will be the most well-publicized city-wide meetings in Emeryville history. Not so. The first of the Task Force's six public meetings was held on April 29th, although one will search in vain for any mention of it on any School District website. This lack of notice constitutes a violation of Sacramento's Brown Act, which sets the actual "ground rules" for public meetings, Emery proclamations notwithstanding. "One Task Force member asked for clarification on the ground rule asking members not to speak with the media, wondering whether this applied to blogs and other local electronic media. Yes, it is intended to cover all media; having Task Force members refrain from speaking to the media ensures that no group member is pushing a specific agenda by exerting media pressure on other members, and helps to build a culture of trust within the group." The Tattler confirmed that these minutes accurately reflected the discussion at the meeting through a non-member that was present. The Task Force, which meets to decide the fate of properties in the Triangle neighborhood, meets across town at Ralph Hawley on May 20th at 6:30 p.m.
Oh, To Be Madison Marquette! With the end of Redevelopment Agencies throughout California, Emeryville residents might have assumed that the days of giant giveaways and massive subsidies to developers by our City Council had come to an end. Not so! Our resourceful City Council has found a new way to give millions of dollars to one of its favorite recipients of public funds: Madison Marquette Corporation, owner/developer of Emeryville’s Bay Street Mall. On the agenda this coming Tuesday, May 21st, the City Council will consider allowing the Washington DC based Madison Marquette to pay back just $11.5 million on a promissory note owed to the former Redevelopment Agency where the principal amount, as of May 1, 2013, was $18.345 million, a giveaway to the billion-dollar company of $6,845,000. This write-down is justified in an April 16th memo prepared by Emeryville’s Director of Economic Development and Housing, Helen Bean, in which Ms. Bean states that the present value of the principal balance at a 7% capitalization rate equals the proposed payoff amount. Agency subsidy. Now they're getting $6.8 million. don't use and an expensive drain on our police services. The City would not see the entirety of the $11.5 million payoff. Like any debt owed to the former Redevelopment Agency, the money would be sent to the County Auditor to be distributed to the relevant taxing entities, with the City receiving 22% of the payoff, or just over $2.5 million. The Oversight Board and the state Department of Finance would also have to sign off on the deal. This promissory note is complex and full of legalese, but when our former City Manager, Patrick O’Keeffe, goes out of his way to sign a non-binding letter of intent to enter into this deal on his very last day of work, something smells funny to the Tattler. Furthermore, while a payoff amount that eliminated the interest owed could make sense, it boggles the mind to imagine the response from Wells Fargo if you called them up to offer to pay off your home mortgage by paying just 62% of the principal owed on your home. That kind of thing doesn’t happen for the 99%. Those kinds of sweetheart deals are only doled out by Congress to their Wall Street cronies or our own City Council to its 1% developer friends. School District to Open City Dump? In a bold maneuver apparently designed to respond to critics of the planned Emeryville Center of Community Life (ECCL), the Tattler has learned that the School District has scrapped its plans for the ECCL and now intends to place a City Dump on the San Pablo Avenue site instead. Future site of the Emeryville Center of Community Life as seen in May 2013. The Tattler first brought you the story of the lingering presence of discarded toilets on School District property on April 25th, by which time the District's rubbish pile had already been in place for many weeks. 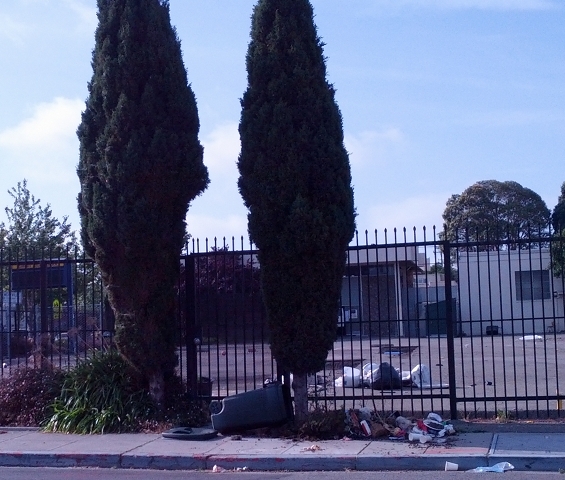 Blight begets blight, as they say, and now weeks later with the District's trash still in place it seems others have seen the wisdom in the School District's vision for a grand entry-way into our City on the corner of 53rd Street and San Pablo Avenue. Perhaps there could be a community dump-naming contest! We submit the "Emeryville Center for Community Trash." In times like these it would be nice to have a Community Preservation Officer one could contact with concerns about compliance with municipal regulations concerning blight, but in the last round of budget decisions our City Council thought it wise to fire our long-serving Community Preservation Officer. They obviously could see no work for her to do. It's another fine example of the partnership between our City and School District. Perhaps they can get together to have a private "robust policy discussion" about the wisdom of this new dumping ground. Emeryville's City Attorney has ruled that documents in the possession of the City and the School District outlining meetings of public officials that took place behind closed doors will not be made public according to a letter recently received by the Tattler. The City Attorney, Michael Biddle, ruled that the release of the documents would harm the public now and that the public would be further harmed later because government officials would not be able to engage in "robust" behind closed door discussions necessary for good public policy formulation. One of the documents, a major traffic study regarding the new Emeryville Center for Community Life (ECCL), was requested by the Tattler in April from both the School District and the City. Both refused to provide the document in response to a California Public Records Act request and as a result Emeryville residents can now only guess what public officials know about the traffic impact that will be caused by the ECCL that officials are unwilling to share with the public. The Emeryville Center for Community Life, still years from being completed, has recently disappointed residents that hoped it would live up to the environmental promises made by both School District and City officials. First, this February we saw the School District request special permission to be exempted from the City’s LEED environmental standards for Emeryville public buildings. In a 3-2 vote, the City Council allowed this environmental promise to be broken. More recently, in April, we saw the School District back before the City Council requesting that it be exempted from another environmentally-friendly requirement that it found bothersome, the General Plan’s requirement that there be a bicycle and pedestrian path along the western property border of the proposed ECCL site. While this 3-2 vote of the City Council preserved the path in the City’s General Plan, none of the most recent ECCL designs show any intention by the District of actually building the required path. With the School District’s record clear, the Tattler has decided to watch carefully the District’s compliance with the California Environmental Quality Act (CEQA) as it proceeds with the ECCL design and construction. On April 11th the Tattler wrote ECCL project director, Roy Miller, requesting all Environmental Impact Reports related to the planned ECCL, all CEQA notices, and to be placed on a list of “interested parties” to receive all future CEQA notices. Mr. Miller replied that such documents were not currently available and would be available at the District office once “they have been prepared for public release”, presumably after having been scrubbed clean. However, we were surprised a few days later with the release of the monthly Progress Reports, dated March 1 and April 1, prepared by the City’s Building & Planning Director, Charlie Bryant, which each describe the School District providing the City with a copy of a traffic study for the ECCL project, and the City’s Building and Planning department responding to the District with comments. The Progress Reports reveal no details of the traffic study. If the earlier request for CEQA-related documents was not clear enough, the Tattler again wrote to the School District’s Roy Miller to request a copy of this ECCL traffic study. For good measure, the City also received a request for the same ECCL traffic study document. After several days, lawyers for both the City and the School District flatly refused the Tattler’s request for Public Documents. City Attorney Biddle responded on behalf of the City that the traffic study was a “draft” not subject to the Public Records Act. Mr. Biddle’s letter claims that “the public interest in withholding those records clearly outweighs the public interest in disclosure,” citing a California Supreme Court decision called Citizens for a Better Environment v. Department of Food and Agriculture. Readers might find it as amusing as we did to read the court opinion cited by Mr. Biddle (in the link above), because what the Court actually decides in that case is that the documents at issue have to be disclosed to the extent the document contains factual material and that only the expressions of opinion have to be redacted. So, clearly this top secret ECCL traffic study is either entirely a work of opinion, and therefore not subject to disclosure, or a work containing factual material that the City and School District are improperly withholding from the public. This leaves one to wonder what value a traffic study would have to a CEQA process if it were made up entirely of opinion and contained no facts on which to base those opinions. Leave it to our School District to break exciting new ground in purely fictional traffic studies! Bravo! The Tattler expected nothing less. Mr. Biddle also argued that the documents requested were “deliberative materials necessary for robust agency discussion” and therefore subject to an exception to the Public Records Act intended to foster “robust policy discussions.” This is what the Tattler has always found to be true of both our City and School District. They never shy away from a “robust” policy debate… just so long as the public isn’t included. If we're allowed to listen in, presumably the talk becomes wimpy and feeble. This City and this School District, fearful as they are of transparency should come clean with regard to this withholding of documents. We ask again, are these environmental documents for the Center of Community Life factual in nature? If so, the City Attorney's own citation requires their release to the public, by his own reckoning he must make them available. And in that case, Mr Biddle and the School District is wrong, for they are harming the public more by withholding these documents than by releasing them to the rightful owners, the public. School District Wraps Up "Teacher Appreciation Week"
Are Emery Teachers Feeling Appreciated? It's been Teacher Appreciation Week at Emery Unified School District and teachers were feelin' the love all week long in the form of special treats and riots of flowers from the School District. Alas, come Monday morning it will have all passed and it'll be back to the grind for Emeryville's most under appreciated public workers. Elsewhere in California, school districts only celebrated Teacher Appreciation Day, May 7th, but here at Emery, it's been all week. With large school yard banners conspicuously turned towards the community at large, the School Board obviously wanted to send a loud and clear message to the citizens that teachers are much appreciated at Emery Unified. After the hoopla dies down, listening to the concerns of Emery teachers however causes one to wonder just who Teacher Appreciation Week here is really for. Because without any fanfare, the School Board has been busy doling out pain to teachers during the other 51 weeks of the year. From sub-standard compensation to cutbacks on hours driving some into part time positions with fewer benefits to outright lay-offs for others causing increased work loads for the rest to the shameful disregard of the Teachers Resolution litany of grievances against the Superintendent of the Schools presented last year, Teacher Appreciation Week smells like just another Emery School District public relations campaign. Perhaps it's meant to make the School Board members feel better for the shoddy treatment routinely meted out to the teachers. Real appreciation involves respect and that's what's missing here. The School Board showed their lack of respect for the teachers in spectacular fashion last summer. After the teachers showed up en masse at a School Board meeting in June and read aloud their Teachers Resolution of no confidence in Debbra Lindo, the Superintendent, the School Board countered at the following meeting by reading aloud their own resolution of support of the Superintendent. More than 90% of Emery teachers signed their Resolution. Since then, shockingly, there's been no meaningful effort on the School Board's part to address the teacher's legitimate concerns. This School District has shown a propensity to lay out the platitudes freely and sometimes shamelessly. That's what's happening this week. But we'd like to see some real teacher appreciation here for a change. Councilwoman Jennifer West reports the South Bayfront Bike/Pedestrian Bridge, an Emeryville Redevelopment Agency project some ten years in the planning and subsequently killed when Sacramento dissolved redevelopment agencies statewide two years ago, has been revived. The bridge is planned to cross the railroad tracks and connect the Bay Street Mall with Horton Street and points east. The City of Emeryville won its case against the Department of Finance of the State of California on Thursday. Ms West told the Tattler she will do everything in her power to move the project along as quickly as she can in the wake of this important victory. Councilwoman West's blog post is HERE. After 12 years of fighting, Emeryville's Bicycle Pedestrian Advisory Committee recently managed to convince the City Council to remove a controversial yellow parking zone on Horton Street near the Amtrak station and today the Public Works Department ceremoniously painted over the yellow curb with red paint. Bicyclists in the bike lane will now no longer have to swerve out into the vehicle travel lane to avoid hitting commercial vehicles parked in the infamous yellow zone, blocking the bike lane. It's been a long hard slog for bicyclists to simply convince lawmakers to remove this one dangerous parking spot and bikers tonight are celebrating. In any other town the simple removal of a single unsafe parking spot would hardly be a cause for celebration. 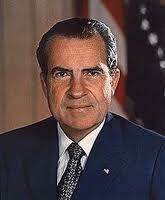 It would just be considered normal government functioning, not even newsworthy. This isn't any other town however, this is Emeryville, and the parking spot in question wasn't just any spot, it was a spot prized by Wareham Development, the most favored developer in town. According to rumors, Wareham Development recently told city officials they no longer objected to removing the parking spot, freeing the Council to finally placate the bicyclists. For their part, the Council didn't explain why they changed their minds about turning the commercial parking zone into a no parking zone. Over the years the East Bay Bicycle Coalition and the California Bicycle Coalition joined Emeryville's Bike Committee in pleading the City Council to rectify the dangerous condition. The Bike Committee itself voted unanimously three times to get rid of the parking spot but to no avail...until now. The yellow zone was created in 2001 by the City Council after Wareham Development asked for it as a result of their new building at 5980 Horton Street being constructed without a commercial parking area for delivery trucks. Wareham looked instead to the City of Emeryville to provide a free on street parking spot for their tenants use. Bicyclists in town cried foul after the City painted the curb yellow in the bike lane but for 12 years the Council showed no interest in the bicyclist's concerns. Former City Councilman John Fricke even told his colleagues that the yellow zone in a bike lane might actually be illegal, inviting a lawsuit if a bicyclist were to be hurt as a result of swerving into the travel lane but the Council majority was unmoved and still the yellow zone remained, vexing bicyclists....a tangible metaphor for who runs this town. As of today, all of that is now past. 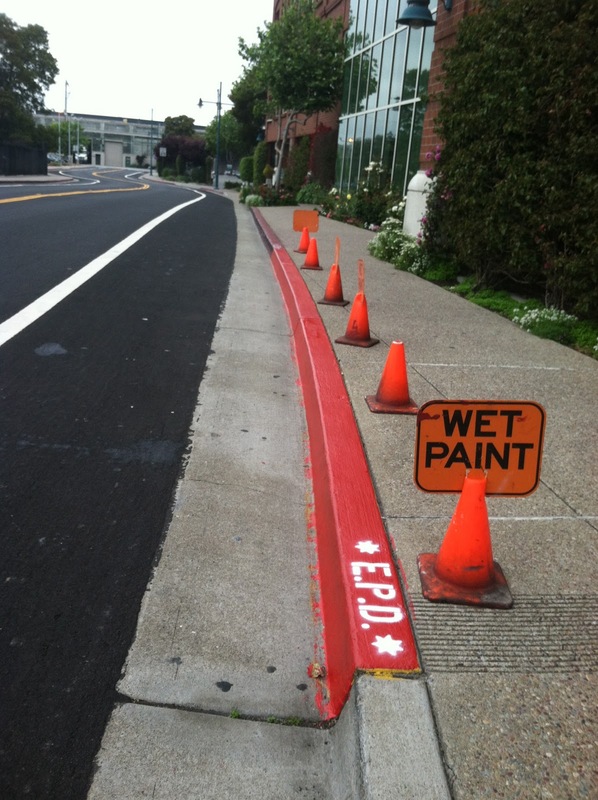 A yellow zone is removed today in Emeryville...what's next? A victory 12 years in the making! on the Horton Street Bike Boulevard. "I'm Sorry, I Don't Have That Information"
The Emery Unified School District lost a rare battle April 2nd when it failed to convince the City Council to amend the General Plan to delete a planned bike/pedestrian path near the future school site at the Center of Community Life (ECCL), causing School District watchers to conjecture about how the District is going to regroup to try to force the closure of this path. The fact that even chief Emeryville City Planner Charlie Bryant openly speculated at that meeting that the District would not abide by the Council's decision to keep the path, gives Emeryville citizens an idea about the level of arrogance and the obstinacy of this School District. The Emery Unified School District really does not like the idea of a bike/pedestrian path running alongside the proposed Center of Community Life. They never elucidated precisely why they hate the path but the lengths the District went to force closure of this path are really quite extraordinary. Point man Roy Miller, the District's architect (how many school districts do you know that retains an architect as a permanent employee?) purposefully denied City Hall decision makers the information they need to make an informed decision about it. The first body to decide about the ECCL path was the Planning Commission at their meeting on February 28th. At that meeting Mr Miller testified the existing high school swimming pool was going to be saved and the width required for the proposed bike/ped path would mean the pool deck would be compromised to such an extent as to render it useless. The Planning Commission Chair, Venessa Kuemmerle asked Mr Miller how wide the existing pool deck is in order to get an idea of what he was talking about. That's when Roy Miller, District architect in charge of the Center of Community Life told the Commission he wasn't sure, "I'm sorry, I don't have that information " he told the Commission. He did say he knew it would destroy the pool's usefulness, an outright falsehood. What he failed to tell the Commissioners is that the pool deck has plenty of extra room and it could easily be reduced a few feet to accommodate the path. Onlookers might have been shocked to hear about a District architect that would not have this basic dimension information at hand especially since Mr Miller has been immersed in all aspects of this school campus build out for some 10 years. 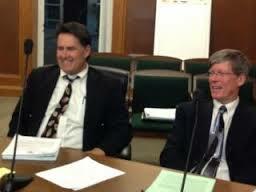 Nevertheless, Roy Miller came unprepared for that Planning Commission meeting, if you believe his claim. To those who feel inclined to believe Mr Miller, perhaps you should ask why, after he was chastised by Ms Kuemmerle, would he again fail to provide that same information a few weeks later, when asked by the City Council, at the Council meeting on April 2nd? Once again, the Council needed to know how large the existing pool deck is so they could make an informed decision about the path, but again Mr Miller responded with, "I'm sorry I don't have that information." With schools Superintendent Debra Lindo looking on, he did volunteer that the deck is too small and the path would render the swimming pool useless. Superintendent Lindo it should be noted, moved to protect her employee after the performance at City Hall. She refused to comment after the meeting, on Mr Miller's tactics used against the City Council. Roy Miller was called before the Planning Commission and the City Council to provide unbiased and objective information. We like to think the three Council members who voted to keep our General Plan didn't believe Mr Miller when he claimed to not know how much space is available at the pool deck. We're happy the School District's tactics didn't work on April 2nd. So we have to ask, why is Roy Miller still in the School District's employ? Is this how the District plans on operating all the way down the line with the Center of Community Life? Will the District ignore the ruling by the City Council to save our General Plan and our ECCL bike/ped path? With its history of shutting down dissenters on the Center of Community Life and these sort of arrogant tactics brazenly used, we say its time to reel in this District. We expect the School District to honor the City Council's decision to save the ECCL bike/ped path. 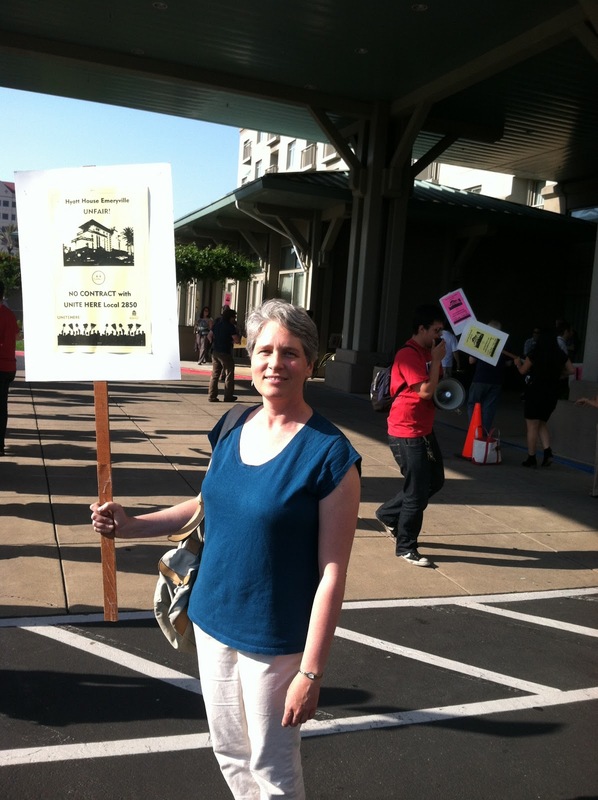 Talks broke down between members of an incipient labor union and management at Emeryville's Hyatt House leading to a protest picket line of approximately 100 workers Friday. Union organizers told the Tattler the contention centers around wages and work conditions but bad faith negotiating on the managers part is central to the protest. Union Committee members say a colleague was disciplined and written up for poor work performance, a false claim, the day before the protest as a way to intimidate the Committee. The black mark on the committee member's record, the first, could ultimately lead to termination. The employee in question has a stellar work performance history for four years prior to Thursday, union organizers were quick to point out. Management officials denied the charges. Union organizers say talks broke down after management broke their promise and refused to answer questions regarding particulars for organizing a union at the hotel. Coincidentally, the same building, located at 5800 Shellmound Avenue, was the site of a multi-year protest of Woodfin Suites Hotel based on non-compliance of an Emeryville living wage for hotel workers law. Woodfin lost their gambit to deny the workers their back wages after the law took effect. After the court ruling, Woodfin sold the building and moved out of Emeryville.